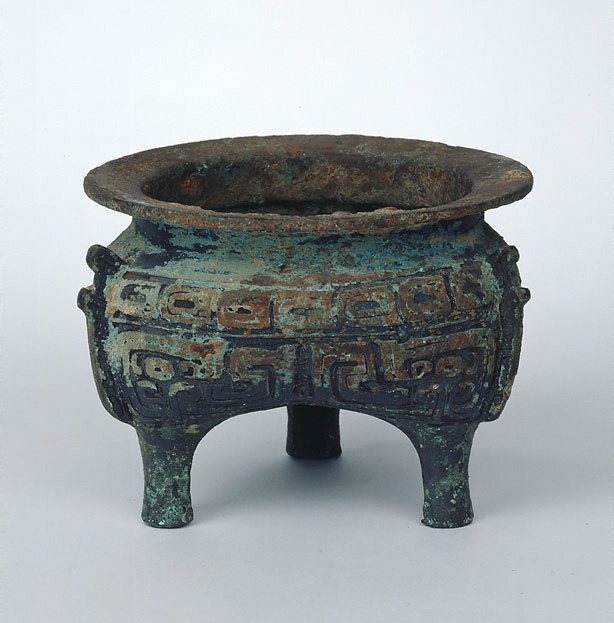 This vessel exhibits the usual triple-vertical division, and contains some of the most typical features of the middle to late Zhou style. The upper belt on the main body is decorated with the so-called 'scale band' in flat relief. The decoration is divided into three panels by three flanges that correspond to the legs. An inscription of six characters 'Guo Zhong zuo gu zun li' incised along the inner edge of the wide lip reads: 'Guo Zhong made [for the Lady] Ji [this] honoured 'li' [cauldron]. The inscription is significant, since it clearly indicated that the cauldron was associated with the ancient state of Guo. During the transitional period from Western to Eastern Zhou (770-256 BCE), when the Zhou king's power was in decline, a strong neighbouring state of Guo, the Jin, under the rule of Marquis Xian, annexed Guo in 655BCE. Although we know the state of Guo did exist during the Western Zhou, its history has been unclear. The discovery of some 234 tombs at Shangcunling in Sanmenxia, Henan, in 1956-57, however, began to shed some light. Among over 9000 objects excavated from these tombs were only 181 bronzes. In 1990 archaeologists excavated a Guo royal cemetery to the north of the original excavation site. To date they have excavated five large tombs that belonged to two marquises, one crown prince, one consort and one senior courtier. Tomb 2009 was the largest and contained the fullest assemblage of bronze ritual vessels, 200 in total. Most of these bronzes bear the inscription of 'Guo Zhong', the name of the tomb occupant who was one of the state's rulers. On the basis of historical records and the stylistic features of the bronzes discovered in the tomb, some scholars consider that Marquis Guo Zhong (named Changfu), may have lived during the reign of King Li (r877-841BCE), and was the aide-de-camp of the Zhou king. Not only can this 'li' therefore be precisely dated to the late 800s BCE, it also adds to our understanding of China's tradition of burying artworks with the deceased. Bruce James, Art Gallery of New South Wales handbook , 'Asian Collection: East Asia', pg. 246-287, Sydney, 1999, 246 (colour illus.). Jackie Menzies, AGNSW Collections , 'Asian Art - India, South-East Asia, China, Tibet, Korea, Japan', pg. 173-228, Sydney, 1994, 188 (colour illus.). The Asian Collections Art Gallery of New South Wales , 'Bronzes and Jades', Sydney, 2003, 72 (colour illus. ).